Freek Saris Training Stables are located in Wesepe in the Netherlands, at the Koedijk. The small village of Wesepe is situated between Raalte and Deventer. Because of our location just outside Wesepe, we are surrounded by plenty of unpaved (sand) roads and tracks. Our modern stables are well equipped. This webite provides useful information about our sevices and training methods. 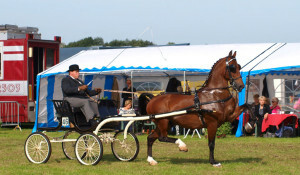 We also frequently post news articles about harness horses, showevents, inspections and competitions. Most of the articles are illustrated with photos. In our stables we can house about 25 horses in comfortable boxes. The stable building is U-shaped, having a large indoor training and exercise arena in the middle. We also have a spacious outdoor training arena, as well as meadows surronding our buildings. We can get your horse broke to drive, train your horse for the stallion and mare inspections, competitions, IBOP tests and showevents. Your horse(s) will be optimally prepared. Please contact us if you are interested in our training facilities and services. We look forward to discuss the all the options with you. Select “contact us” in the main menu above for all the contact details.